Don’t worry — it’s not closing permanently, just for the month of September. 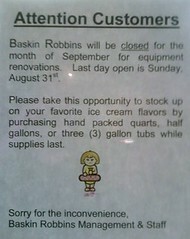 Seems like an awfully long time to close up shop for “equipment renovations,” but I don’t know much about the technology involved in…um…making and serving ice-cream. I assume you only have one BR in GTF? Billings has three I can think of off of the top of my head so we don’t have to worry about a long dry September. Thank goodness. Well I should be able to loose that last 5 pounds! Thanks BR! LOL….